The train rattled alongside a furious river hemmed in by mountains as Andean flute music wafted from speakers above. Then it stopped, nowhere, just like a British train…except that this one was meant to. There was no station, no platform: we just opened the door, dropped to the track and crunched through the gravel until we got to a bridge more rickety even than any I saw in Laos. It swayed and creaked as I hurried across the rotten slats, expecting, any minute, that one would give way and leave me dangling over the river. 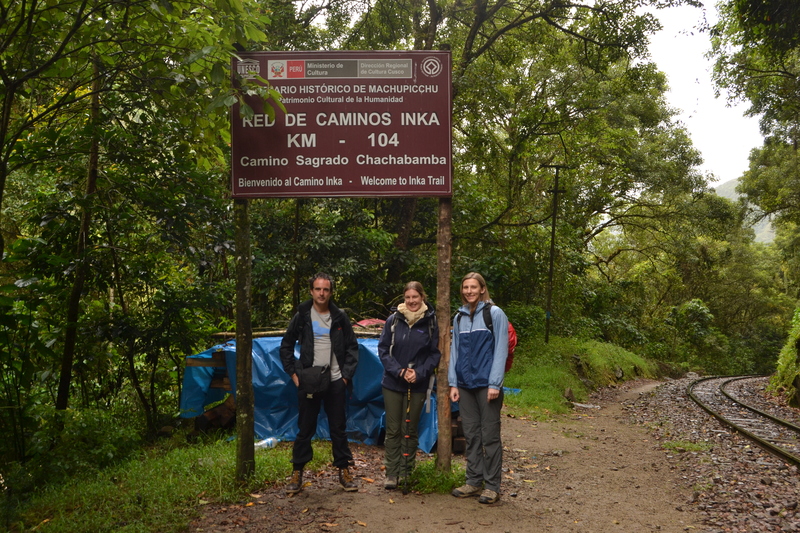 It takes three or four days to walk the length of the Inca Trail, but we were cheating and starting two thirds of the way in. That still left a long day’s hike. The trail led relentlessly upwards, snaked round the mountain, and continued upwards, until we had left the valley we started from way below and the river was but a scribble and the train track a toy shop display. We scrambled up Incan terraces, passed waterfalls which plunged gorgeously down the face of the rock, and looked across at the neighbour mountains carpeted with trees, and paused to contemplate flowers which erupted from the ledge in shocks of yellow and orange, and pink and red. Once we saw porters from the four day trail, running down the mountain with mules-worth of weight on their backs. They carry the tents, the chairs, the stoves, the gas bottles and food so the tourists need not worry about weight. It started to rain and the clouds slipped down and filled the valley like expanding foam and, for an hour or two, we were walking above them. Bepe, the guide, kept stopping so we had a chance to catch our breath and he had a chance to share his passion for orchids; but I wanted to press on and did, until I came to a sign with a picture of a bear and some text I did not understand and jumped to the wrong conclusion. I had just read Bill Bryson’s A Walk in the Woods, in which he worries his way along the Appalachian Trail thinking about bear attacks. But there are no grizzlies in Peru, it turns out, just the spectacled bear: a shy little thing you would expect to have petite-bourgeois manners from the fifties and a bag full of marmalade sandwiches. The sign was urging the walkers not to bother the bears, not warning the walkers that the bears might bother them. I went ahead again, and passed a hard-looking man who glared from a step, and I remembered something I had read in a guidebook about muggings along the trail. Three more men emerged from shelter when I climbed up the steps of Inti Punku, the last but one of the ruins on the trail. “Buen’ dias,” one growled and I looked back with relief to see Bepe and the others at the foot of the steps. “Who were those dodgy buggers?” I asked after we turned the corner. 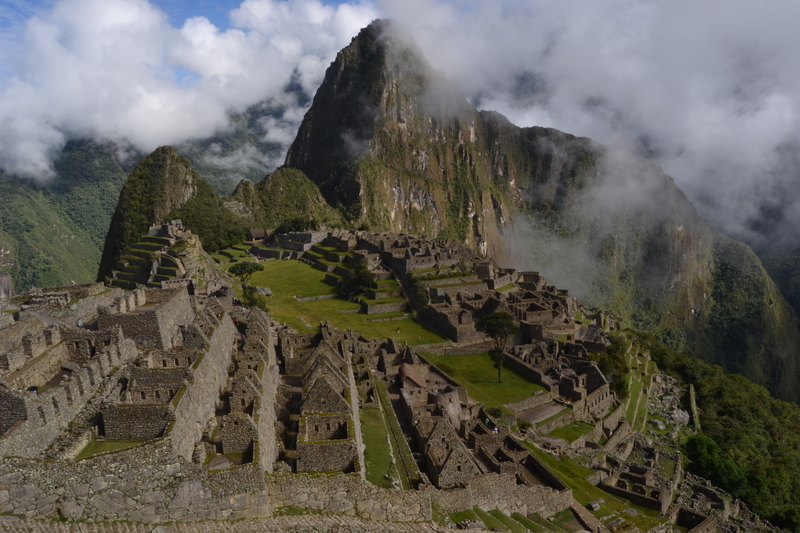 We would, he said, have had a good view of Machu Picchu by then, if it were not for the clouds. I thought he might have kept that to himself. But as we walked on, the clouds dissolved and the iconic image materialised before us, just as it is in the brochures. It was a magical effect. I would do the train without a second of thinking – I love climbing and love challenges. It’s well worth doing. Probably the full four day trail too, with camping stops. I think you like camping more than I do. 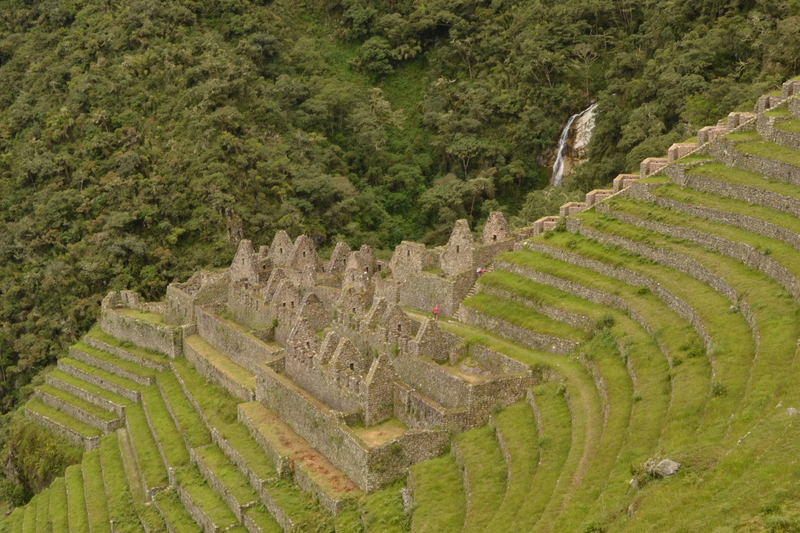 Good things to know for when I FINALLY visit the Inca Trail. I did the four day hike. 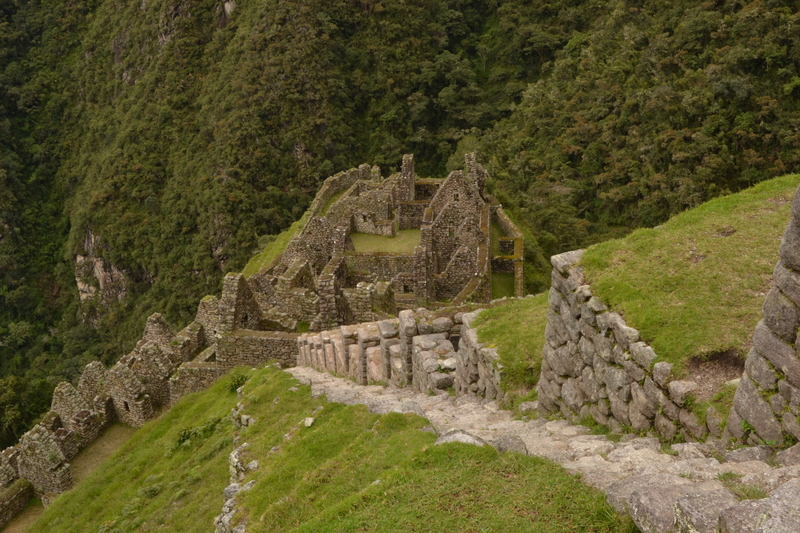 We left our campsite pretty early but, by the time we had arrived at Machu Picchu, it was closer to the afternoon. Similarly it came out of the clouds as you had described in your post. 🙂 I wrote about some of my hike in one of my first posts on my WordPress. Tragically one of the hikers in the group ahead of us fell of the trail and died!